Pop quiz, what’s the first thing you think of when you think of Idaho? Unless you’re my parents (hi Mom!) I’m 100% certain you thought about potatoes. 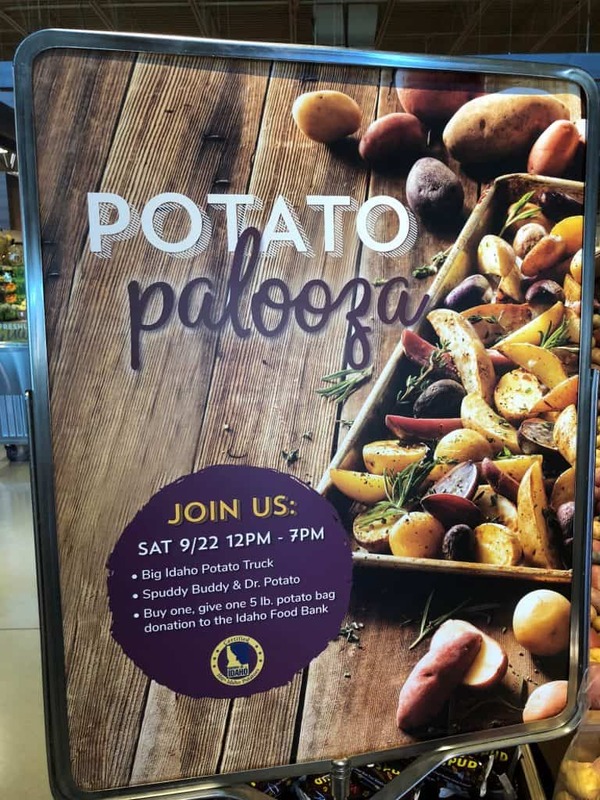 We grow a lot of potatoes in Idaho, and this week Albertson’s on Broadway is celebrating. 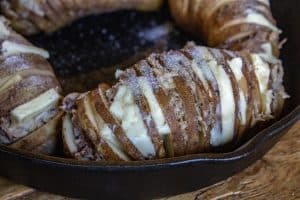 There are so many amazing things you can make with potatoes, but today I’m going to share my smoked Hasselback potatoes recipe. 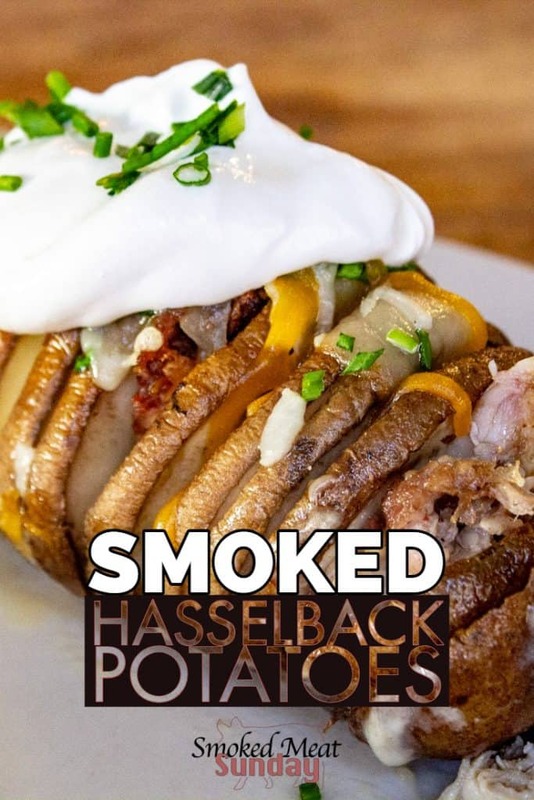 Ultimately, smoked Hasselback potatoes are just a really fancy baked potato, with way better flavor. 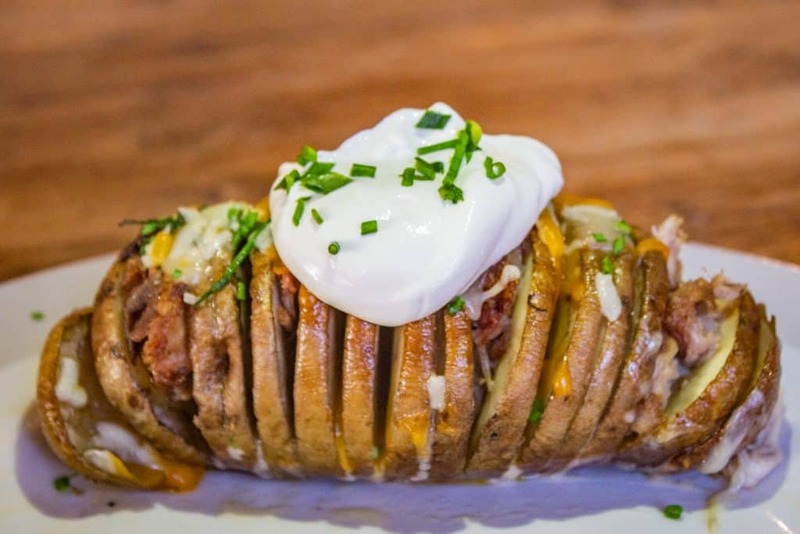 I probably don’t have to tell you the first thing you’ll need (Idaho Potatoes) to make smoked Hasselback potatoes. I bought four not too big not too small Idaho potatoes for this recipe. 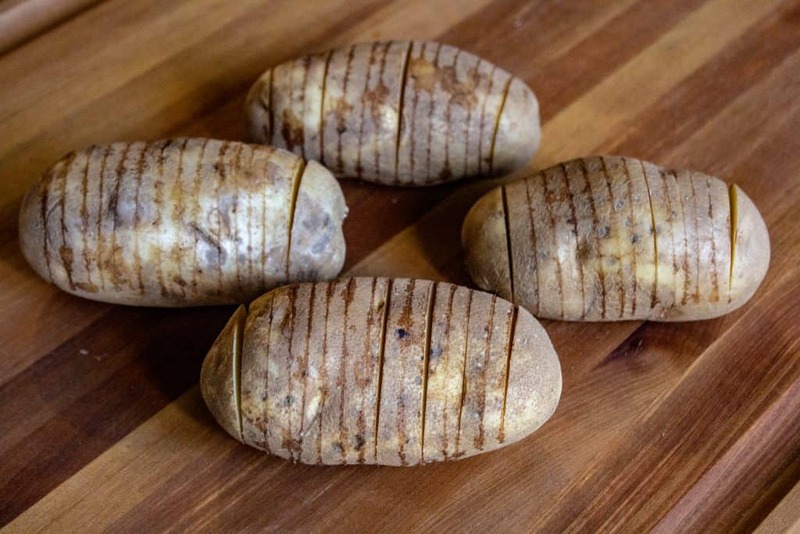 What Makes Idaho Potatoes So Special? Know what’s really cool? Dr. Potato is going to be at Albertson’s on Broadway this week! While you’re there learning everything you can about potatoes check out all the other cool events going on! Potato 101 with Dr. Potato: 9/20 3-6 pm, 9/21 3-6 pm, 9/22 12-3 pm – Learn everything there is to know about Idaho Spuds from the expert himself! September 22nd from 12 pm-7 pm: The Idaho Potato Commission and the Great Idaho Potato truck will be on site. There will be free samples, games, and you can even get photos taken with Spuddy Buddy! During that same time, for every 5 lb. bag of Idaho potatoes purchased, the Idaho Potato Commission will donate a bag of potatoes to the Idaho Food Bank! How awesome is that?! 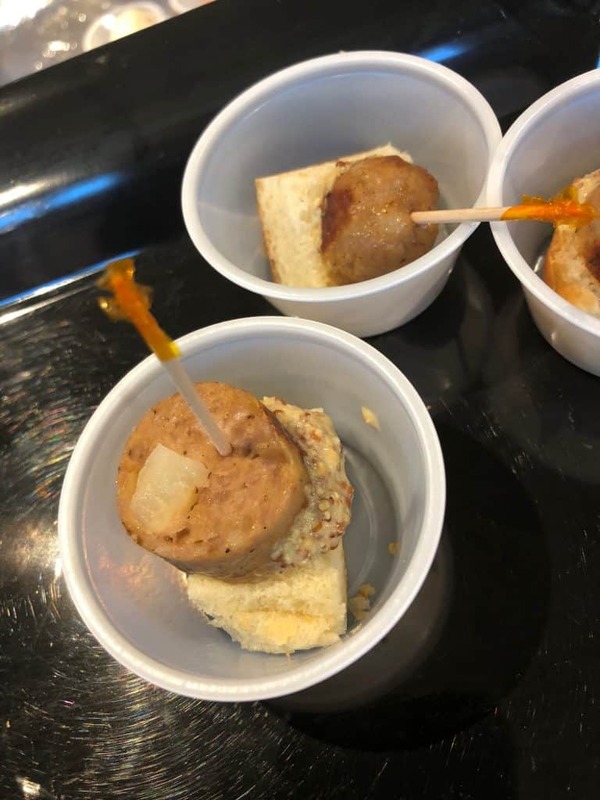 These Potato Bread and Sausage samples were to die for. In addition to the great events above, “Cooking with Potatoes” takes place every day from 11 am-7 pm. During this event, you can explore how to use potatoes in unexpected ways, and try potato sausages and potato rolls. After you get your potatoes grab a block of Muenster cheese, some butter, fresh chives, and some garlic salt. You’ll also need some leftover pulled pork or cooked bacon. 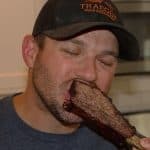 My preference is pulled pork. I like Muenster cheese for this recipe over cheddar or pepper jack but those are both good options too. Albertson’s on Broadway has one of the best cheese selections and the on-site experts can help you out if you’re looking for a specific flavor. I’m cooking these potatoes in a cast iron skillet – If you don’t have a skillet you can also use a disposable aluminum pan. 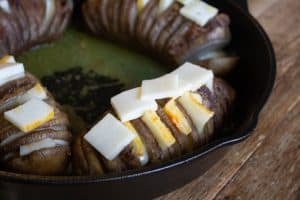 One of the reasons I love smoked Hasselback potatoes is because of all the flavor you get in every single bite. The key to getting all that flavor is in the prep work. 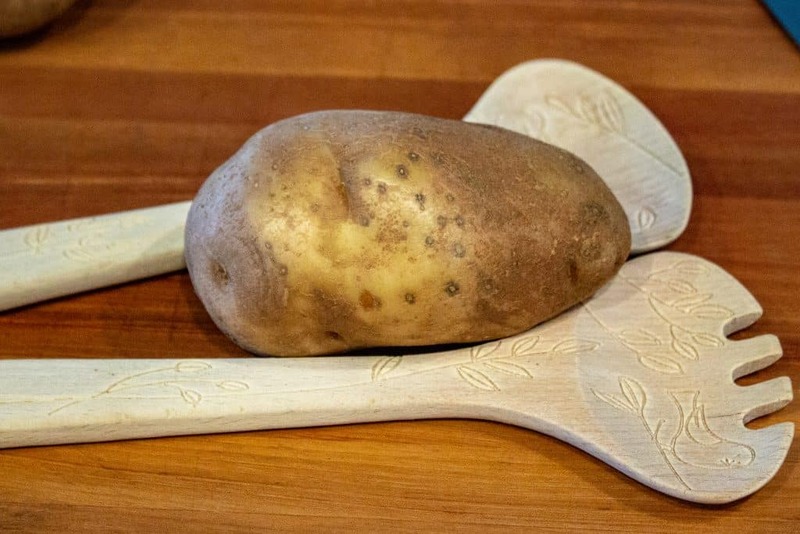 After you wash, scrub, and dry your potatoes grab two wooden spoons and lay them parallel to one another. Put a potato in between the two spoons, and start slicing. The wooden spoons act as a stopper. Make the slices about a 1/4″ apart. Grab a stick of butter, and slice it into 1/4 tablespoon pieces. And by fun, I mean just a little bit tedious. But the end result is worth it! Alternating between slices, place a pat of butter, and then a small piece of pulled pork. You can use the back of a butter knife to push the meat or butter down into the slot. This isn’t going to look pretty when you’re done, but that’s ok.
Sprinkle the potatoes with garlic salt, and then cover the skillet with tin foil. 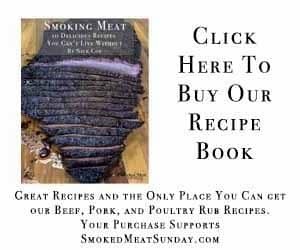 Set your smoker to cook at 300 degrees. Once the smoker is up to temp, put your cast iron skillet in, and let the potatoes cook for an hour. After an hour remove the foil, and carefully push a small slice of cheese into each of the slots that once held the butter. The cheese is going to melt while you do this, and that’s ok. Put additional slices of cheese on top of the potatoes, and then put the skillet back in the smoker and let it cook uncovered for another hour. The potatoes are done when the internal temp hits 210 degrees. Sprinkle some more cheese on top of each potato, followed by a dollop of sour cream, and fresh chives. BOOM – This will be the best potato you’ve ever tasted. 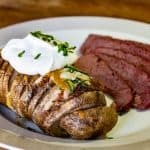 These smoked Hasselback potatoes could be a meal by themselves, or you could serve them alongside a ribeye or corned beef brisket for a super hearty meal. You definitely NEED to make these potatoes. If you’re in Boise don’t forget to stop by Albertson’s on Broadway this week to get all of your ingredients. Learn a little more about potatoes while your there, and experience some new and fun ways to cook potatoes! 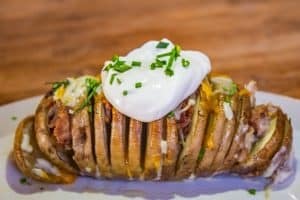 Are you looking for the best way to make potatoes? This smoked hasselback potatoes recipe is so easy to make and they are LOADED with flavor. Grab two wooden spoons and lay them parallel to one another. Put a potato in between the two spoons, and start slicing. Make the slices about a 1/4" apart. Alternating between slices, place a pat of butter, and then a small piece of pulled pork. You can use the back of a butter knife to push the meat or butter down into the slot. This isn't going to look pretty when you're done, but that's ok.
After an hour remove the foil, and carefully push a small slice of cheese into each of the slots that once held the butter. The cheese is going to melt while you do this, and that's ok. Put additional slices of cheese on top of the potatoes, and then put the skillet back in the smoker and let it cook uncovered for another hour. Sprinkle some more cheese on top of each potato, followed by a dollop of sour cream, and fresh chives. BOOM - This will be the best potato you've ever tasted.